I love coffee but I don’t like to drink it every morning. I don’t like to need anything, so I try to vary my morning beverage. I enjoy tea tremendously but it just isn’t a coffee substitute for me because it doesn’t have that full body, rich flavor most of the time. I am also familiar with Ayurvedic herbs because my mother has always like Ayurvedic herbs for the health. I was very curious when I heard about an Organic Caffeine Free Coffee Substitute Ayurvedic Roast and I was happy to get the chance to review it. I recently ran across Ayurvedic Roast and I was immediately very curious. To begin with I was impressed that the Ayurvedic Roast is a Organic Caffeine Free Coffee Substitute. I also was impressed that it includes three antioxidant, adaptogenic, and immunity-enhancing organic ayurvedic herbs. “What are the health benefits of Ayurvedic Roast? Besides the immediate health benefit of not drinking coffee, this unique blend features three of the most revered herbs from Ayurveda, the oldest system of natural self health care in the world. Commonly known as the the “ginseng of India“. This amazing herb promotes strength and stability in the overall functioning of the physiology, in addition to being an anti-oxidant. It builds up immunity and strength, and calms the mind and body*. This has many of the benefits of Ashwagandha, along with balancing and augmenting its beneficial effects. This is the most common herb used in Ayurveda to lessen mental strain and worry*. It also helps increase intelligence and clarity*. In combination with the other 2 herbs, it has a soothing effect on the mind. Organic Caffeine Free Coffee Substitute Ayurvedic Roast Ingredients: organic rye, organic barley, organic chicory, organic ashwagandha, organic shatavari, organic brahmi, and organic vanilla flavor. This all sounded great so I tried Organic Caffeine Free Coffee Substitute Ayurvedic Roast for myself and here is my review! Ayurvedic roast comes in a package that looks like a coffee package. When you open it, the Ayurvedic roast looks similar to ground coffee. 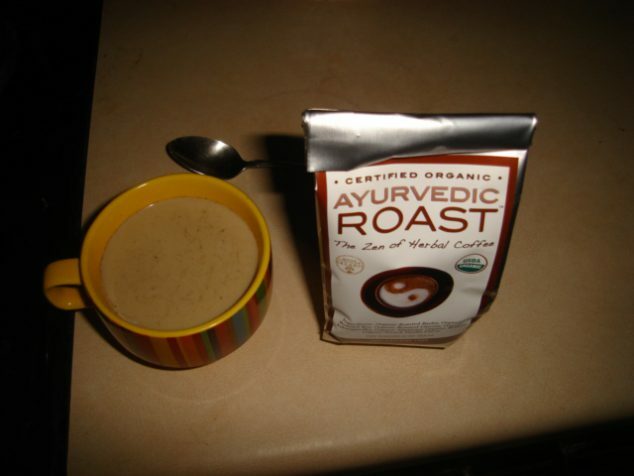 Then when you brew Ayurvedic roast, you can brew it just like you do your coffee. This all helps with the ritual of coffee. I just put mine in my stove top espresso maker and it brewed up just like normal. I mixed it with my usual amount of milk and a little raw sugar and it was really good! I really like the thick, rich flavor of the Ayurvedic roast. It doesn’t taste exactly like coffee but it tastes very similar because of the bold richness. It has an extra exotic taste and smell. Very lovely, unusual flavors that I find hard to describe but pleasing to the palate. I really like the Ayruvedic Roast! 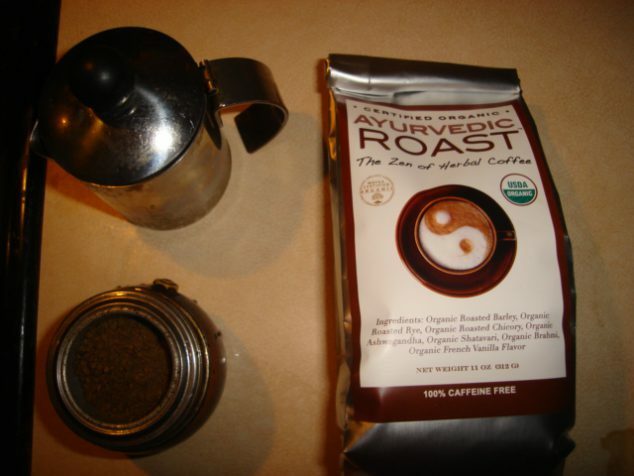 Want to try some Organic Caffeine Free Coffee Substitute Ayurvedic Roast for yourself? Ayurvedic Roast did provide me with a sample in the hopes that I would share my honest opinions. I received no monetary compensation and the opinions expressed are my own.